Anisa Khan who has been in private practice for approximately 20 years. The firm offers personal service to all clients and specialises in the following arrears of law viz criminal and civil litigation, divorces, transfer of property, property law, winding up of estates, motor vehicle accident claims and insurance claims, collections, antenuptial contracts, (various facets of the law). The firm also offers additional service that is Mediation. Anisa Khan Attorneys is a dynamic law firm, backed by 20 years of experience and success. this firm is led by Anisa Khan, a seasoned Attorney whose work encompasses a broad spectrum of the law. 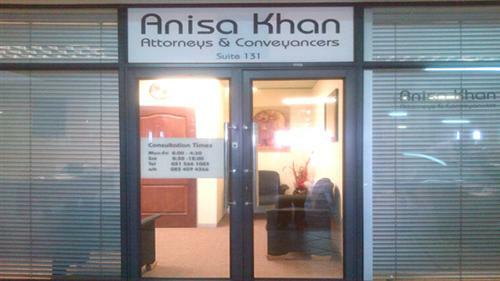 Anisa Khan Attorneys has established itself as a leading law firm of Attorneys in Verulam / Durban. Anisa Khan was admitted as an Attorney on the 01 June 1994. She is also an admitted Conveyancer and holds a Bachelor of Arts Degree and Bachelor of Law Degree (LLB), both of which were obtained at the University of Natal. She further holds a Diploma in Taxation, which was obtained at the Rands Afrikaans University and Certificate in Labour Law, obtained from the University of Cape Town. She is a qualified Estate Agent and an Accredited Mediator.